ITEM IS EQUIPPED WITH FLOWER HOLDERS ON THE TOP. 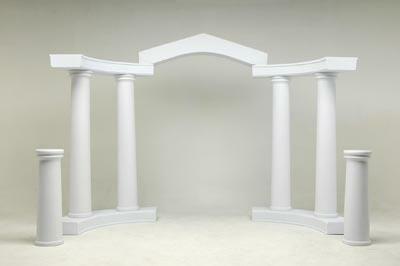 OUR UNIT IS ARCHED RATHER THAN PEAKED AND DOES NOT HAVE THE ADDTIONAL COLUMNS IN THE FRONT. The is space in the top of the Tuscan to hold 10 - 4" flower pots or vases. *****THIS ITEM IS DELIVERY ONLY***** SET UP IS INCLUDED. * Please call us for any questions on our backdrop tuscan style rentals in Tacoma, Lacey WA, Olympia and the South Sound Metro area.